Native aspect ratio is 5:4 (1280x1024). Otherwise image is stretched or pillarboxed, see Scaling. Resolution can be set, but image will be stretched or pillarboxed. 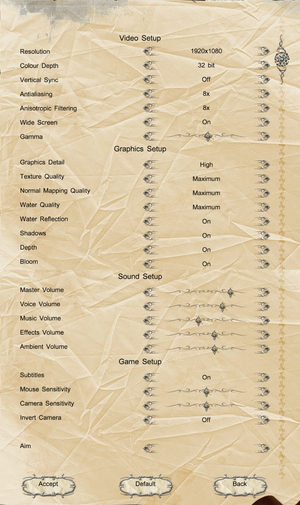 Wide Screen option in game settings switches between 60 and 70. For other values see Field of view (FOV). Only in Borderless fullscreen windowed mode. 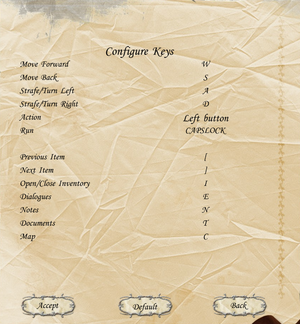 Open game.ini with any text editor. Change fixed_aspect_ratio to true for pillarboxed mode or false for stretched. 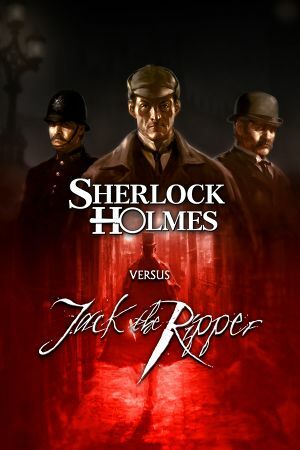 Go to the %APPDATA%\Games\sherlock holmes versus jack the ripper\. Open setup.ini with any text editor. Change fov to the desired value. Change windowMode to YES for borderless mode or NO for exclusive. Uninstall all versions of PhysX on PC. Remove file PhysXLoader.dll from <path-to-game>\ if you have copied it there previously. Download and install latest NVIDIA PhysX. Download and install NVIDIA PhysX Legacy System Software. Make sure PhysX is installed. Locate file PhysXLoader.dll. It should be present in %PROGRAMFILES(X86)%\NVIDIA Corporation\PhysX\Common\ in 64-bit Windows and %PROGRAMFILES%\NVIDIA Corporation\PhysX\Common\ in 32-bit Windows. Switch game to borderless fullscreen windowed mode. Change FOV value to 100, see Field of view (FOV). ↑ 1.0 1.1 File/folder structure within this directory reflects the path(s) listed for Windows and/or Steam game data (use Wine regedit to access Windows registry paths). Games with Steam Cloud support may store data in ~/.steam/steam/userdata/<user-id>/11190/ in addition to or instead of this directory. The app ID (11190) may differ in some cases. Treat backslashes as forward slashes. See the glossary page for details. This page was last edited on 19 April 2019, at 03:45.